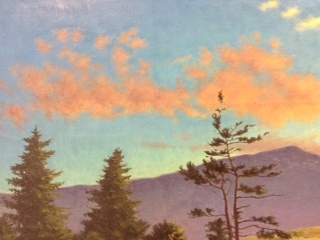 Another Percent for Arts grant allowed me to collaborate with painter Katherine Doyle, putting words in her canvas depicting a tranquil mountain landscape. It hangs in the reception area of the Rockingham County Courthouse. She wanted both her painting and the poem to impart a sense of calm in what is, for almost everyone who passes through, a place of stress and uncertainty. The stories are old, told and retold, in the hour between circumstance and hope where all endings are possible.